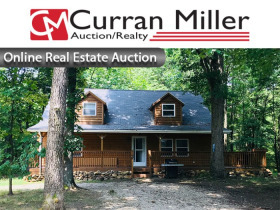 LOG CABIN ON 7+/- WOODED ACRES - Oakland City, IN | Curran Miller Auction/Realty, Inc. 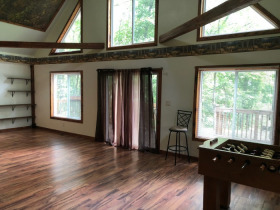 This is truly the perfect home for an outdoor enthusiast who enjoys hunting and fishing in a private setting. The real estate consists of two lots totaling 7 +/- wooded acres with access to great outdoor recreation; including lake access & an easement to the Interlake ATV recreation area. The acreage is improved with a charming 1,800 sq. 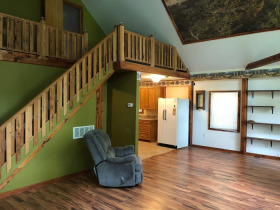 ft., 2 bedroom, 1.5 bath post & beam log home built in 2011. 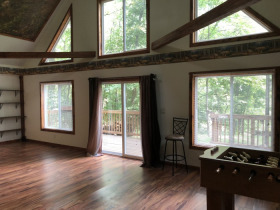 The open and airy living room / dining area feature cathedral ceilings accented with beautiful wood beams, large windows and a sliding glass door leading to the wraparound porch. 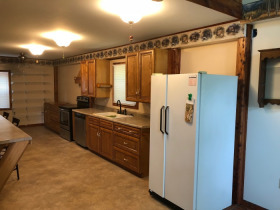 The spacious kitchen contains a breakfast bar, side-by-side refrigerator, double sink, Whirlpool stainless steel dishwasher, Amana glass top range and plenty of storage space. The laundry room is located off the kitchen. The washer and dryer are included in the sale of the real estate. The first floor master bedroom joins the full bath, which has a shower and bathtub. 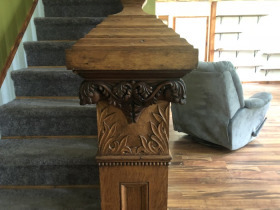 A beautiful staircase salvaged from an 1840 log home leads to the loft, which would make a great play area or office space. 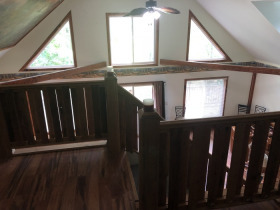 The large second floor bedroom features a vaulted ceiling and half bath. The wraparound porch is perfect for enjoying the peaceful setting. 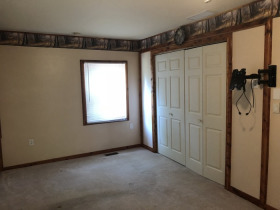 The property is also improved with a 16’ x 28’ pole barn with an overhead door. A $200 road assessment will be paid by purchaser. 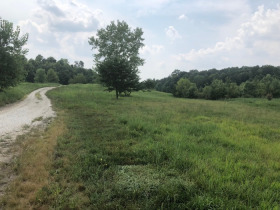 Property Directions: From interstate 64, go north on Hwy 61 through Spurgeon 2 miles to the property on the right. Terms: A 5% earnest money deposit is due within 24 hours of the auction conclusion with the balance due within 45 days. The purchaser shall assume the real estate taxes due and payable in May 2019. Possession will be at the final closing. Any closing fee (typically $250 - $300) charged by a title company or escrow agent to close the transaction will be split evenly between buyer & seller. 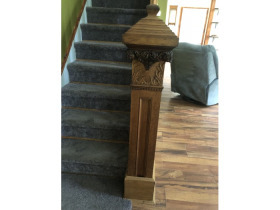 Online bidding is subject to a 5 minute auto-extend closing. The real estate will sell subject to owner’s approval.